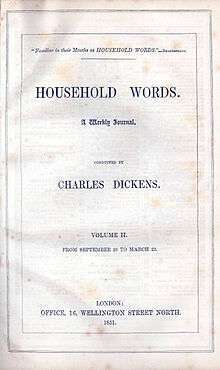 Household Words was an English weekly magazine edited by Charles Dickens in the 1850s. It took its name from the line in Shakespeare's Henry V: "Familiar in his mouth as household words." During the planning stages, titles originally considered by Dickens included The Robin, The Household Voice, The Comrade, The Lever, and The Highway of Life. A longer version of the publication's principles appeared in newspapers such as The Argus in September 1850. Theoretically, the paper championed the cause of the poor and working classes, but in fact it addressed itself almost exclusively to the middle class. Only the name of Dickens, the journal's "conductor", appeared; articles were unsigned (although authors of serialised novels were identified) and, in spite of its regularly featuring an "advertiser", the paper was unillustrated. To boost slumping sales Dickens serialised his own novel, Hard Times, in weekly parts between 1 April and 12 August 1854. It had the desired effect, more than doubling the journal's circulation and encouraging the author, who remarked that he was, "three–parts mad, and the fourth delirious, with perpetual rushing at Hard Times". That Dickens owned half of the company and his agents, John Forster and William Henry Wills, owned a further quarter of it was insurance that the author would have a free hand in the paper. Wills was also appointed associate editor and, in December 1849, Dickens's acquaintance, writer and poet Richard Henry Horne was appointed sub-editor at a salary of "five guineas a week". In 1859, however, owing to a dispute between Dickens and the publishers, Bradbury and Evans, publication ceased and Household Words was replaced by All the Year Round, in which he had greater control. The journal contained a mixture of fiction and nonfiction. A large amount of the non-fiction dealt with the social issues of the time. The Seven Poor Travellers in the Extra Christmas Number (14 December 1854) with Wilkie Collins, Eliza Lynn Linton, Adelaide Anne Procter (under the name "Mary Berwick"), and George Augustus Henry Sala. The Holly Tree Inn in the Extra Christmas Number (15 December 1855) with Wilkie Collins, William Howitt, Harriet Parr, and Adelaide Anne Procter. The Wreck of the Golden Mary in the Extra Christmas Number (6 December 1856) with Wilkie Collins, Percy Hetherington Fitzgerald, Adelaide Anne Procter, Harriet Parr, and Rev. James White. The Frozen Deep, a play written with Wilkie Collins and initially performed in the converted schoolroom of Dickens' London residence, Tavistock House (6 January 1857). "A House to Let" in the Extra Christmas Number (7 December 1858) with Elizabeth Gaskell and Adelaide Anne Procter. Other contributors to Household Words included author James Payn. A complete key to who wrote what and for how much in Household Words was compiled in 1973 by Anne Lohrli, using an analysis of the office account book maintained by Dickens' subeditor, W. H. Wills. ↑ Fitzgerald, Percy Hetherington (1913). Memories of Charles Dickens, with an account of "Household words" and "All the year round" and of the contributors thereto. Bristol, England: J. W. Arrowsmith. pp. 120–121. Retrieved 3 September 2013. ↑ "HOUSEHOLD WORDS.". The Argus. Melbourne: National Library of Australia. 2 September 1850. p. 4. Retrieved 4 September 2013. ↑ Kitton, Frederic George (2004 ed.) The Life of Charles Dickens: His Life, Writings, and Personality, p. 230. Lexden Publishing. ↑ Blainey, Ann (1963). The farthing poet : a biography of Richard Hengist Horne, 1802–84; a lesser literary lion. London: Longmans. p. 179. Lohrli, Anne. Household Words: A Weekly Journal 1850–1859. Toronto: University of Toronto Press, 1973.
see also 'Household Words', Faculty of English Library, Cambridge University. Dickens Journals Online, an online edition of Dickens's journals, Household Words and All the Year Round.